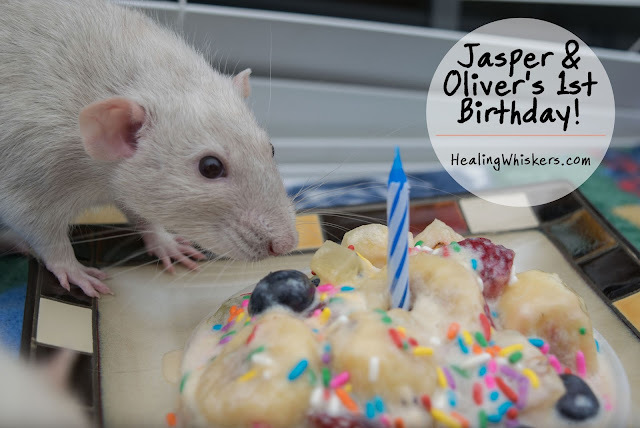 Healing Whiskers: Jasper & Oliver's 1st Birthday! 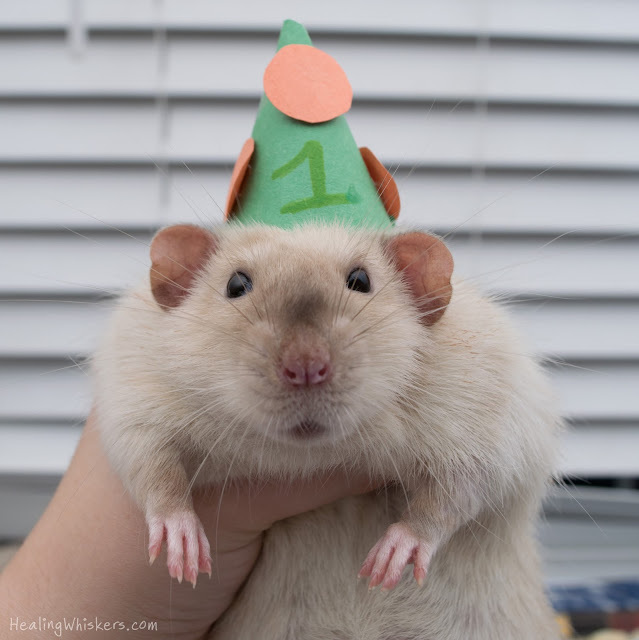 Jasper & Oliver's 1st Birthday! Wow, it is so unbelievable that these two little boys I got in May 2016 are now a year old! 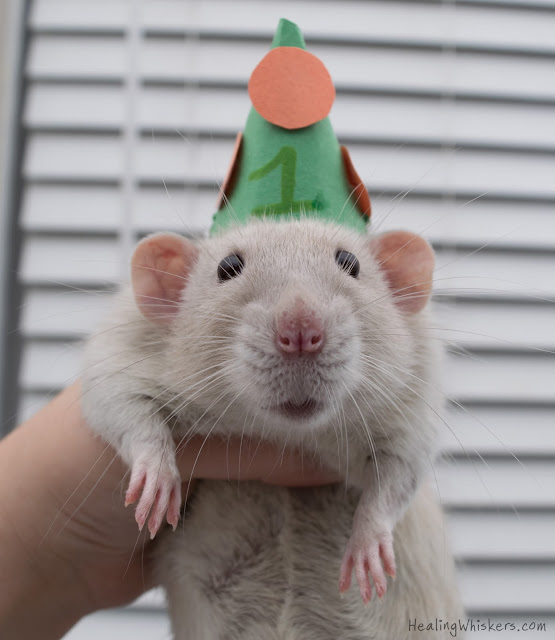 Since rats only live a couple of years, we celebrated big! 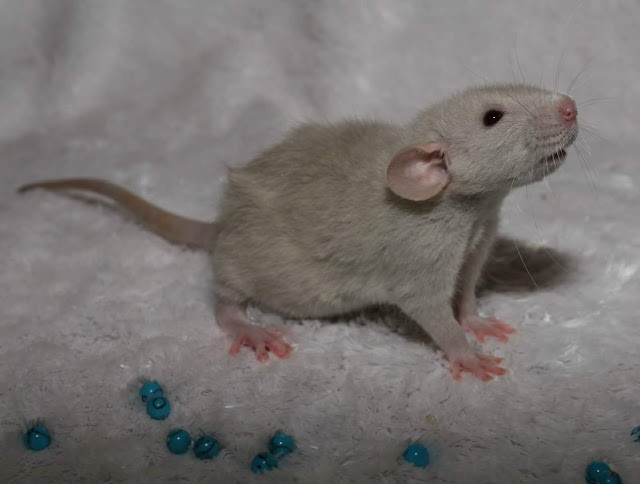 So a little backstory and info: Once my rats Everett and Delmar were starting to get in their senior years I started looking at a baby rat to start therapy training. You know I have my issues with pet store rats - you don't know where they come from so you don't know health history and they are not handled as much as a rat from a breeder. So I was in the group I am an admin for (Georgia Rat Breeders) and spotted some beautiful babies from a breeder in South Carolina. I was set on one rat because I was sure Delmar would be fine with a roommate, but after picking up Jasper, Delmar had senior health issues and passed. So then I had two rats by themselves. I decided to go get Oliver so Jasper could have someone. This turned out perfect because Jasper wasn't a good fit for therapy work with his seizures. When I first picked up Oliver he pooped ALL OVER ME. Heather (the breeder) even asked if I was sure about choosing him. I find it hilarious that the little poo monster can now hold it for a solid 2 hours. Impressive! He is loved by so many and he loves going to events and getting attention. I think it is relaxing for him. Jasper is as sweet as ever and it a big ol chunky monkey who loves food. He is a lot bigger than Oliver and is really muscular. It saddens me sometimes that he couldn't become a therapy rat, but he does brighten people's day online with his photos. I love it when he rests his head between my thumb and forefinger and just licks. Sweetest rat ever. So, for their 1st birthday I went over to Sweet Frog (do you older readers remember Jasper looking for froyo?) and got a bit of cake batter frozen yogurt, blueberries, pineapple, bananas, kiwi, strawberries, and some sprinkles to take home. I mixed it all up and put it in the freezer (I was a bit impatient, thus the melting) then plopped it upside down on a plate and added a birthday candle. Ta-da! 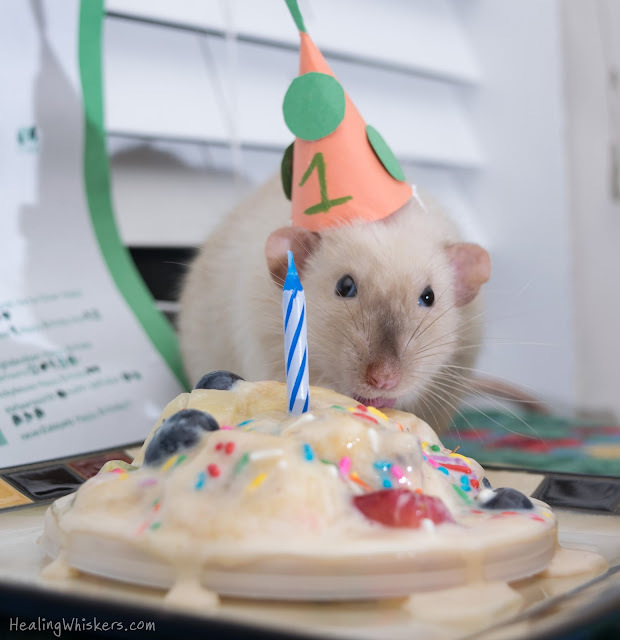 Rat cake. 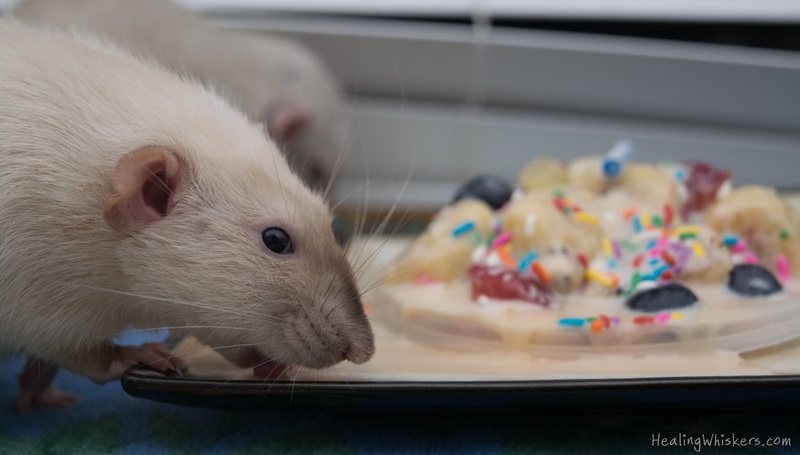 The boys were a bit camera shy eating the cake out of their cage, but overnight they consumed it all. 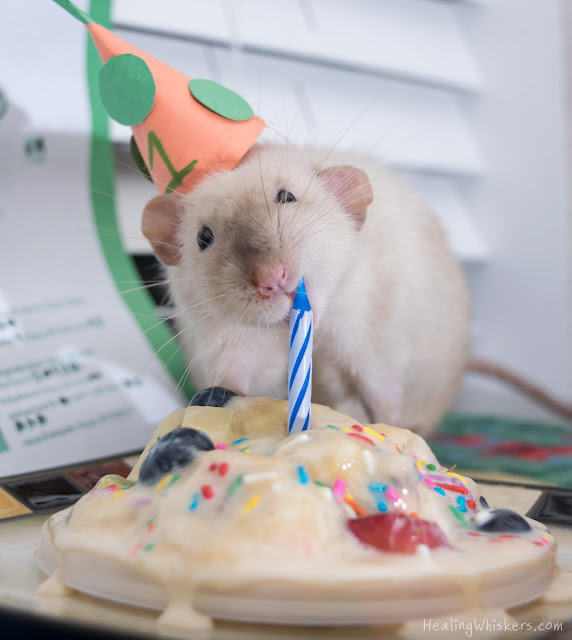 Rat birthday success! I am so very glad to see how beautiful and sweet they are at a year of age. 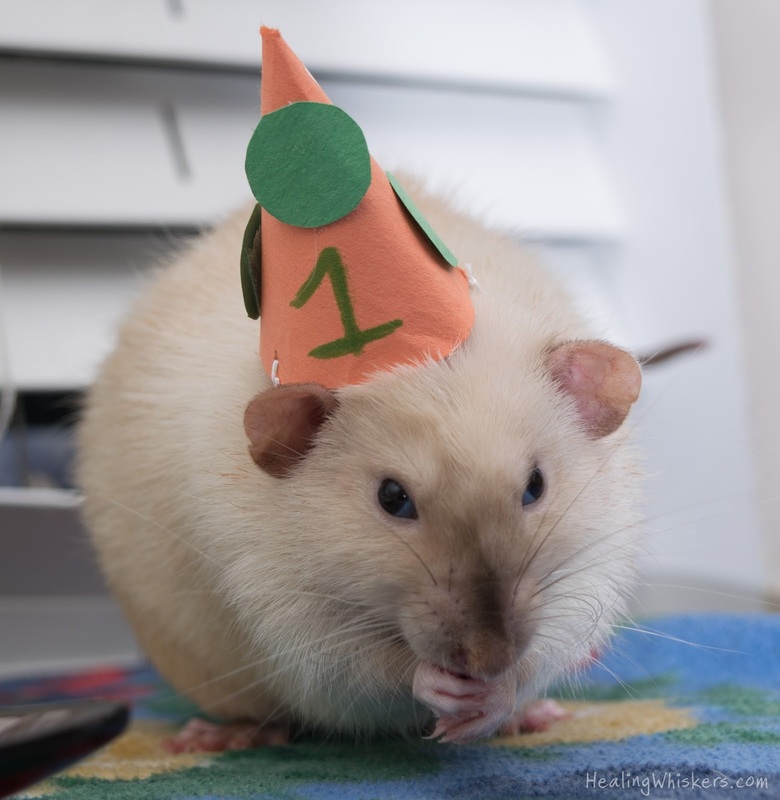 I am also really, REALLY proud of Oliver and his status as a therapy rat. 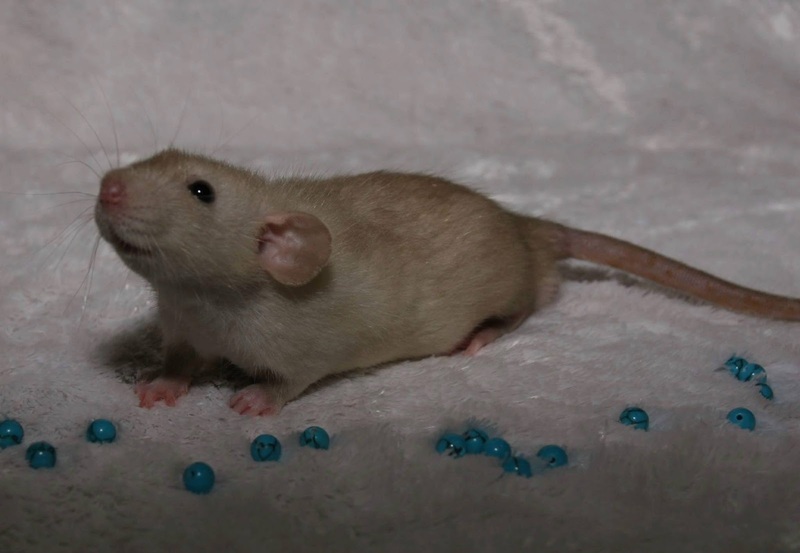 I still have a couple that would make really good therapy rats, including their brother, Loki. I hope to be able to see them at some point! CONGRATS! for your being selected as 'Best Unconventional Pet Blog' BlogPaws Nose-to-Nose Awards Finalist! Wow! What is that dessert you are having for your birthday? Did you wish for a kitty cat to come visit you?! Cute photos & Happy Birthday! Even though I'm a kitty, I would love to be your friend. Tee hee hee!